Up to 75,000 points Welcome Offer: Earn up to 75,000 Membership Rewards® points. Earn 50,000 Membership Rewards® points after you spend $10,000 and an extra 25,000 points after you spend an additional $10,000 all on qualifying purchases within your first 3 months of Card Membership. 5X Get 5X Membership Rewards® points on flights and prepaid hotels on amextravel.com. 1.5X Get 50% more Membership Rewards® points. That's 1.5 points per dollar, on each eligible purchase of $5,000 or more. You can get up to 1 million additional points per year. 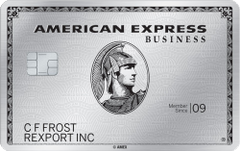 Our take: The Business Platinum Card from American Express offers great travel benefits and a large introductory bonus, but the spending requirement to earn the bonus is daunting, and many small business owners may be hard-pressed to spend enough to qualify for all of the card’s benefits.